Maybe, just maybe, you’ll survive foul Mutants, horrible diseases, insidious plots, and sanity-blasting rituals to reap Fate’s rewards. Scratch an old gamer (urgh!) and you’ll probably find some Dungeons & Dragons in his teenage years. 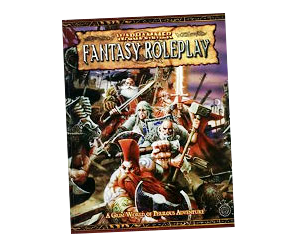 But when it was released in 1986, Warhammer Fantasy Roleplay immediately became our roleplaying game of choice. We started a campaign in ’87 and, after a hiatus of about ten years, started playing again with 2nd Edition. It’s still a bloody entertaining way to spend an evening. Of course, the role of ‘gamemaster’ means I always have to spend ages to prepare the sessions and it can be mentally exhausting to run them. Here are some reference sheets for 2nd Edition that make things a little easier so you can concentrate on the story and the atmosphere, plus a character sheet design. Hello, sorry to be a bother, but according to the Core rulebook, you only receive a -20% WS penalty when performing an Attack with the weapon in your secondary hand. As far as I can see there is no mentioning that this also applies to parry actions. Is this correct, or have I missed someting? I’m sorry, but it’s been years since I played, your guess is as good as mine! Weaon Qualities: Balanced: when in a second hand, ignore the -20% WS. But If you use weapon… Dagger (not take talant Ambidextrous and not Qualities: Balanced) you take penalty -20% WS any action in your secondary hand.